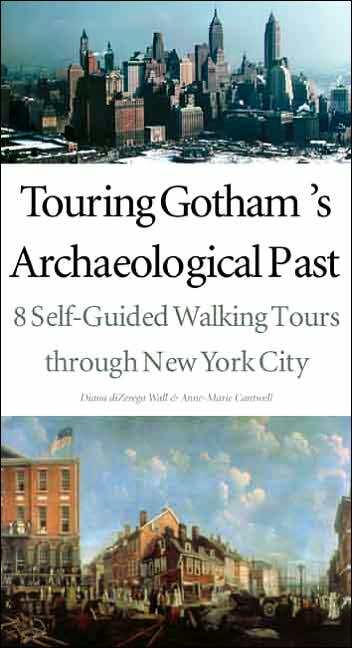 This weekend I dug up a book I had forgotten about, Touring Gotham’s Archaeological Past: 8 self-guided walking tours through New York City. I purchased the book impulsively after taking a class in which we took an archaeological tour of lower Manhattan. Flipping through the book again, I realized there was a chapter on Greenwich Village. The tour includes 17 sites in the Village, some well known and some not so much. They cover big sites like Washington Square Park, Sheridan Square, the Washington Mews and the Merchant’s House Museum. Each site has a short background story and then explains what was found there or what architecture remains there today. One site – 25 Barrow Street – is especially relevant, as the dig was organized by the (then) head of the NYU anthropology department, Bert Salwen. In 1987, the family living in the house at this address contacted Salwen when they were considering adding on to their home. Salwen was aware that there might be a cistern on the property, and organized a four day dig before construction began. He found a layer of coal ash from around 1860, full of artifacts. They mostly found household items such as plates, glassware and toys. In further research, they came up with the names of two families that rented this property around 1860- and assume the housewares belonged to them. Although this site, and most of the others in this chapter, don’t reveal anything groundbreaking, they give an interesting look into the past. It is interesting to think that there are archaeological treasures hidden under Greenwich Village holding undiscovered pieces of information about the people who lived here before us. If you want to take an archaeological tour of Greenwich Village, or want to check out the resources the authors used, this is all from the book: Touring Gotham’s Archaeological Past: 8 self-guided walking tours through New York City. Diana diZerega Wall and Anne-Marie Cantwell. New Haven: Yale University Press, 2004.